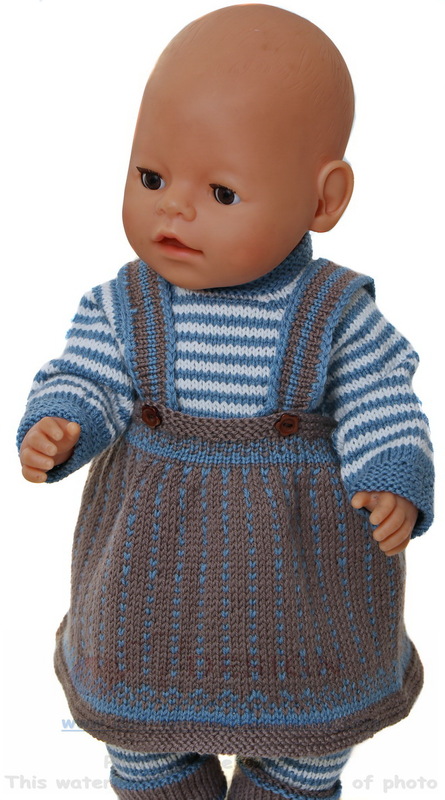 This time I have knitted a garment and called it «Every day’s clothes” for my doll. 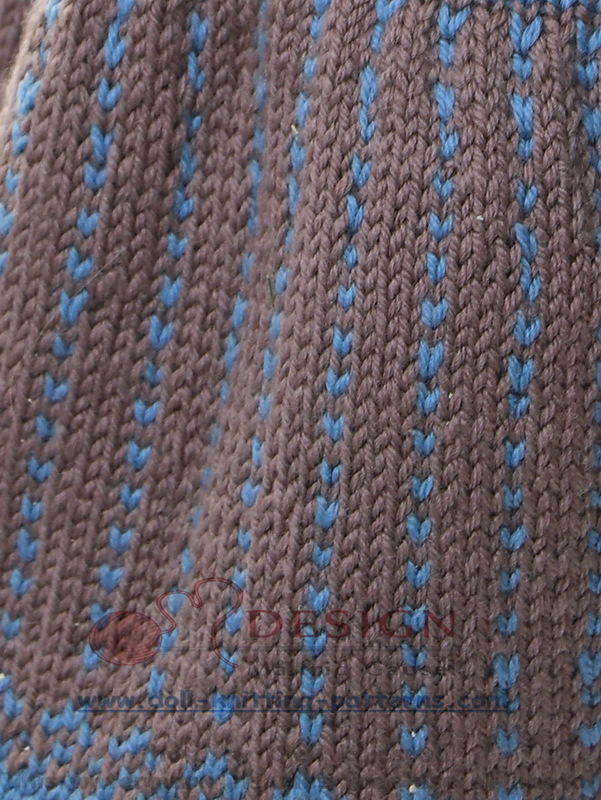 I like this combination of brown and blue together and started knitting the skirt. 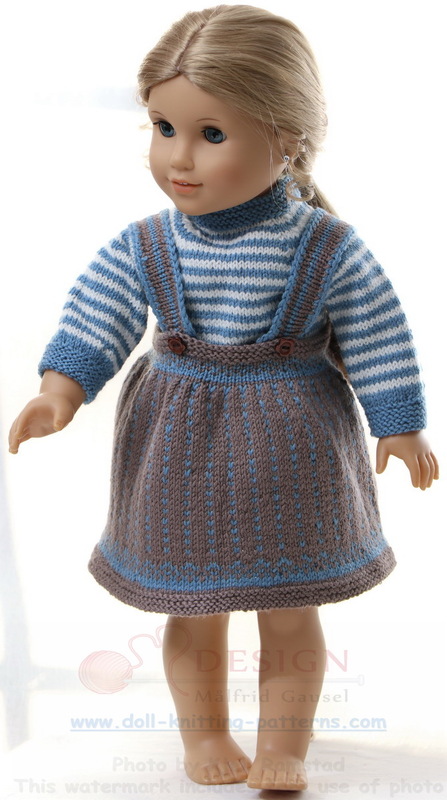 The skirt is knitted in brown. 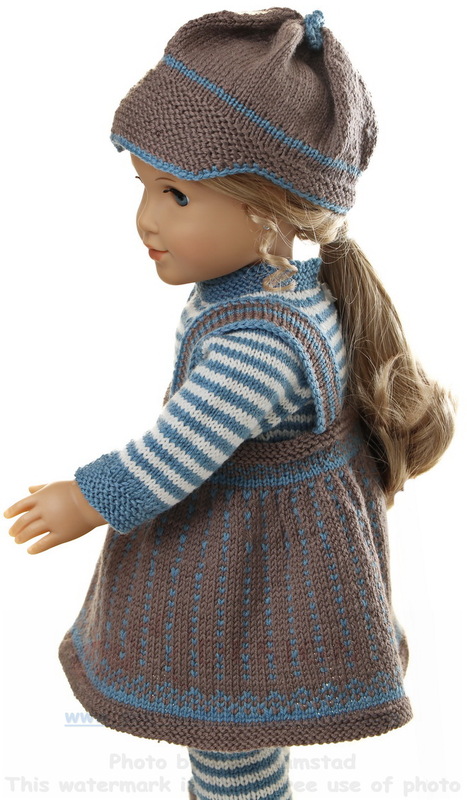 The skirt is knitted in brown. ... and with spots knitted above each other in blue I think the skirt worked out very well. 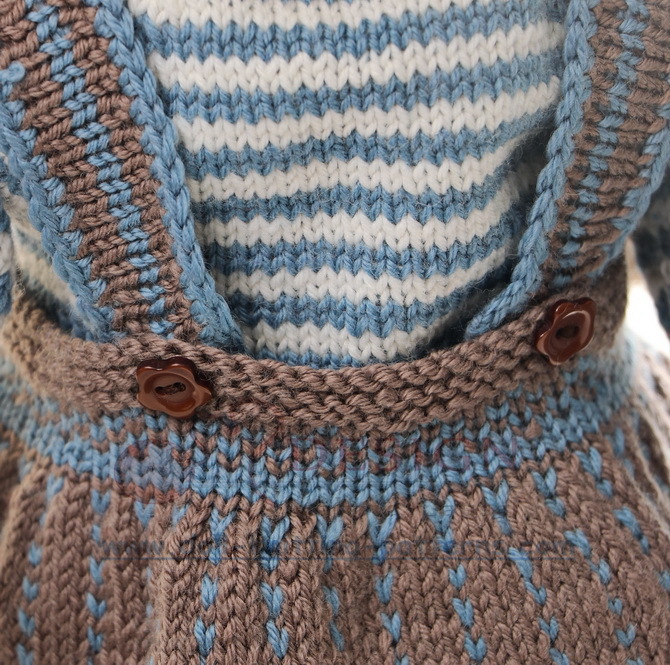 I ended the skirt knitting the same border as I knitted round the edge at the beginning of the skirt round the waist. 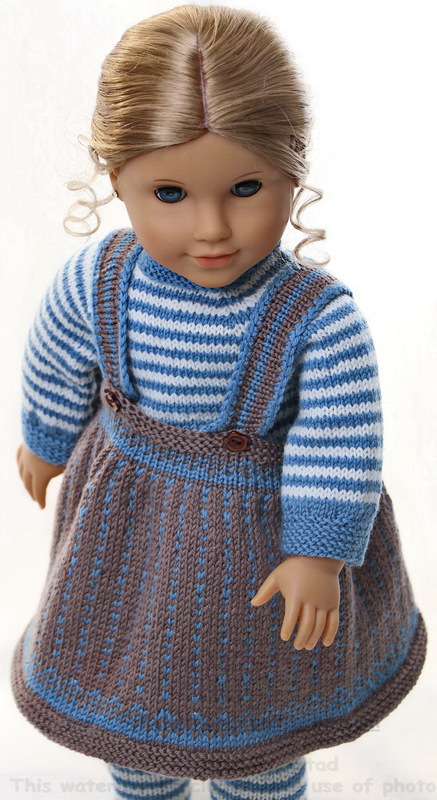 With lovely suspenders, having blue edges crocheted the skirt worked out fine. 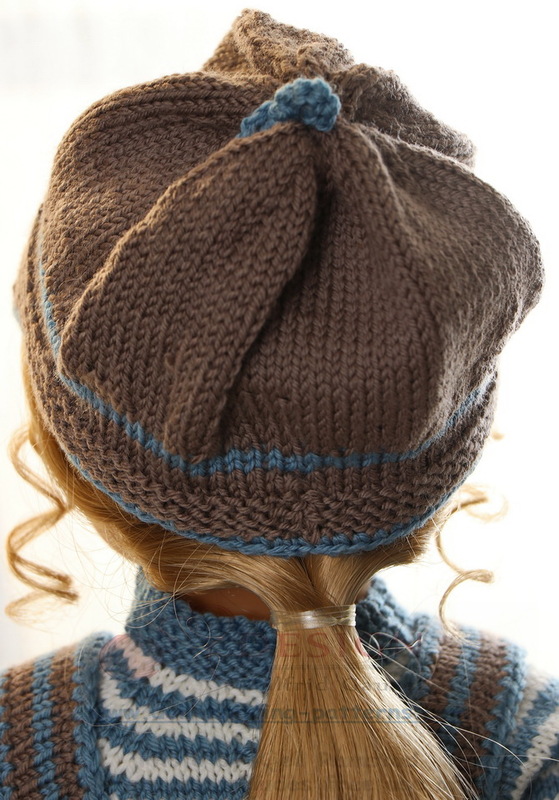 2nd row: knit in brown across row. 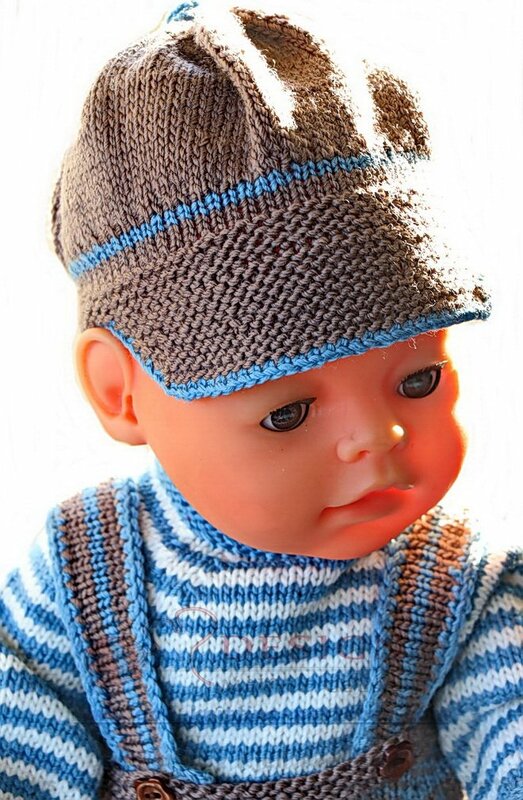 Then I thought that a sweater knitted in stripes would be fine here. ... would be fine here. 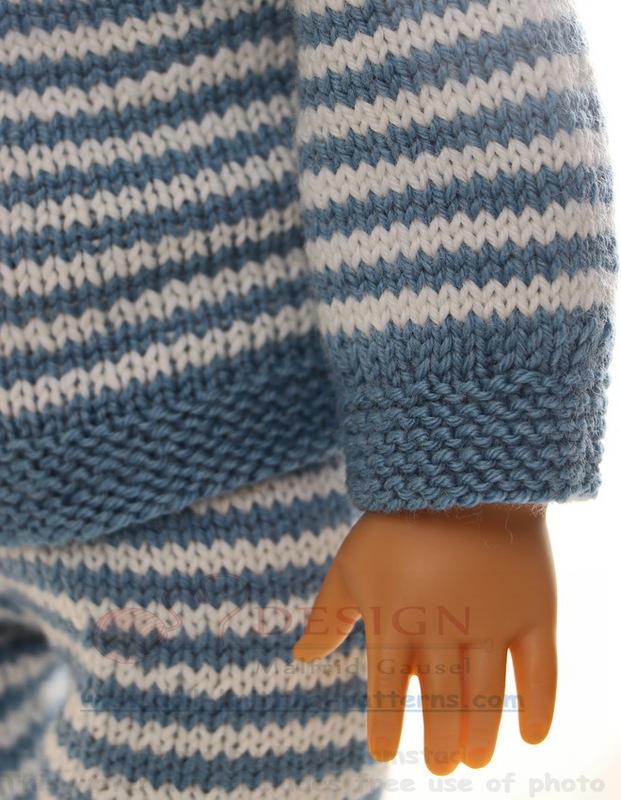 Then I knitted a pants in the same stripes as for the sweater to make the garment complete. 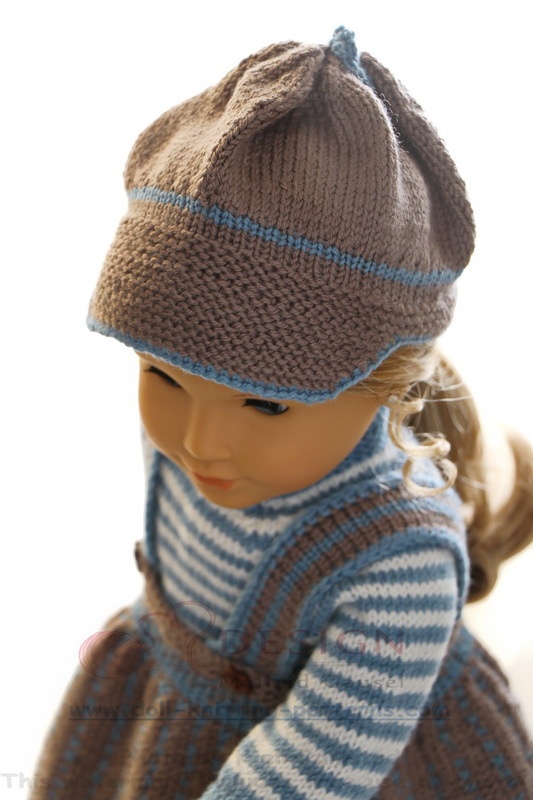 A rough cap with a brim knitted in brown worked out well as belongings to these clothes. 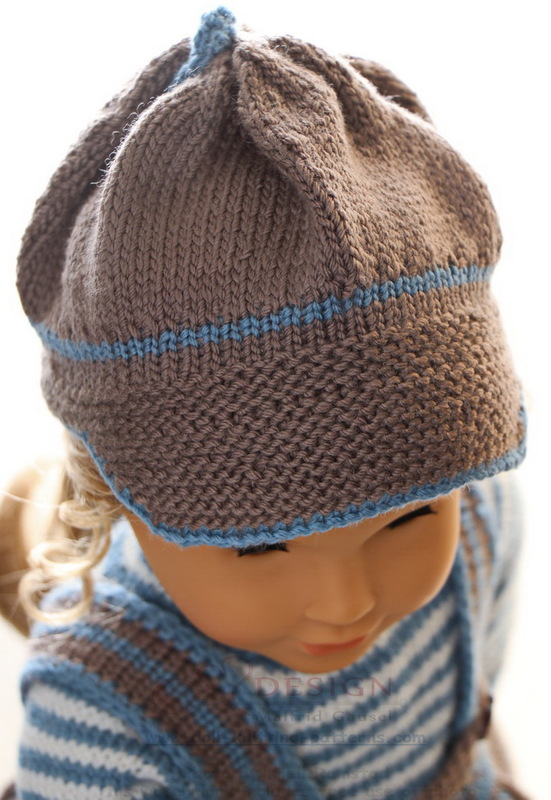 The cap has blue edges. Cast on 80 sts in blue and knit 1 row. 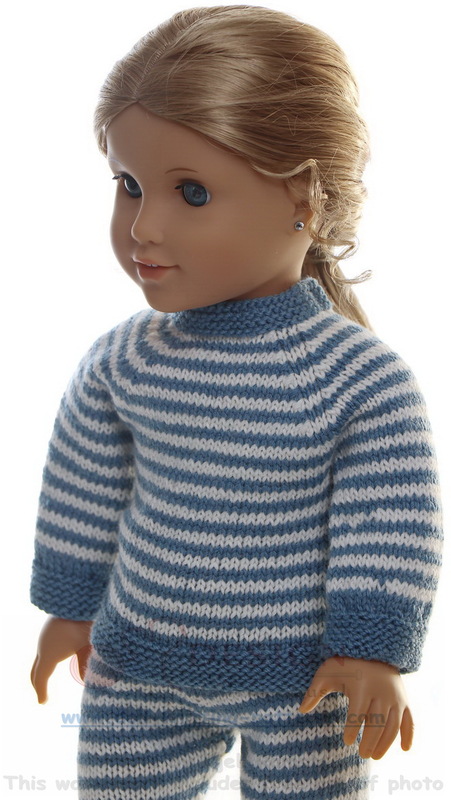 Continue knitting the sts onto a little circular ndl or 4 double pointed ndls, knit in the round and knit a rib, k1, p1 alternatively across rows 6 rows altog. Knit 1 row st st. On next row knit a row of eyelets like this: K2tog, yon alternatively across row. 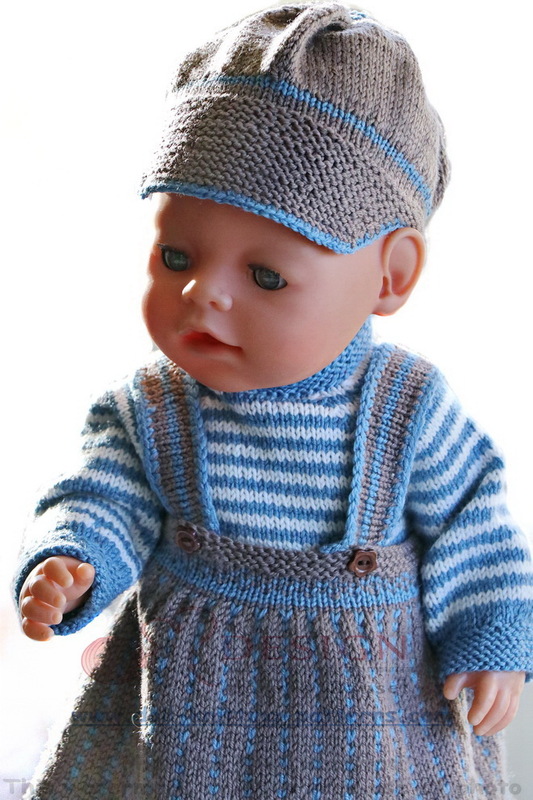 Continue knitting 2 rows st st in blue, 2 rows in white alternatively until work measures 8 cm. Place a marker for center front and center back. Always begin row from center back. Do the following increases: K1, increase 1 sts in next sts, knit until 2 sts before marker front, increase 1 sts in next sts, k2, increase 1 sts in next sts, knit until 2 sts before marker back, increase 1 sts in next sts, k1. 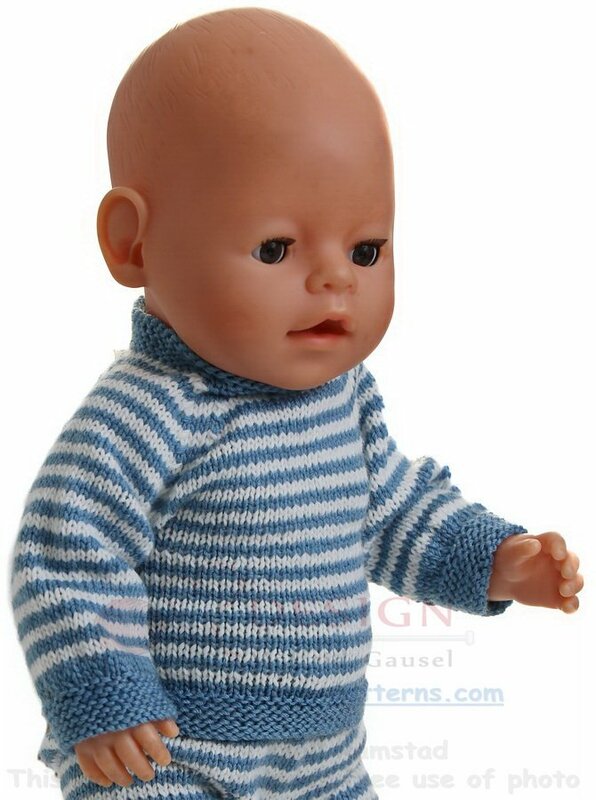 At last, I knitted a pair of brown socks for my doll. 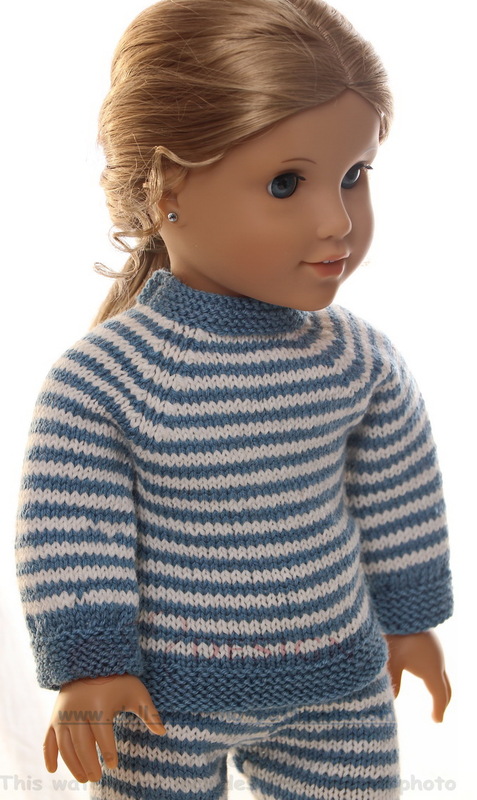 Lovely and warm with blue stripes. 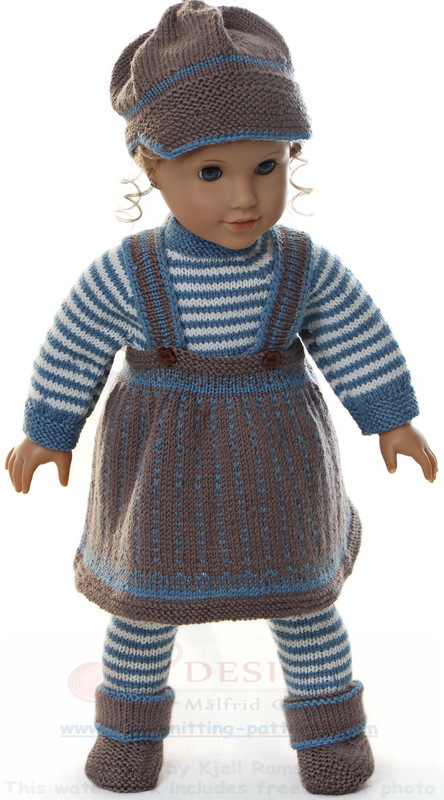 I hope you too will like these clothes and want to knit them for your doll!